Fort Calhoun’s nuclear power plant is one of three reactors across the country that federal regulators said they are most concerned about. Last year, federal regulators questioned the station’s flood protection protocol. NRC officials said they felt the Omaha Public Power District should do more than sandbagging in the event of major flooding along the Missouri river. OPPD officials said they have already made amends and added new flood gates. “We updated our flood protection strategy and have tested and re-tested our new strategy. The issue is operationally resolved, and at no time was there a threat to public safety or was public health at risk,” OPPD President and Chief Executive Officer Gary Gates said. Those upgrades are being tested right now, as the area around the Fort Calhoun nuclear power plant is being flooded. Specifically, the midwestern floods have made the power plant an island, and sandbags, berms and other measures are being deployed to prevent a Fukushima-like problem. On June 9th, an electrical fire knocked out cooling of the spent fuel rods at the plant. On June 6th, the Federal Administration Aviation (FAA) issued a directive banning aircraft from entering the airspace within a two-mile radius of the plant. Virtually every article about the flooding mentions that the Fort Calhoun plant was shut down on April 9. 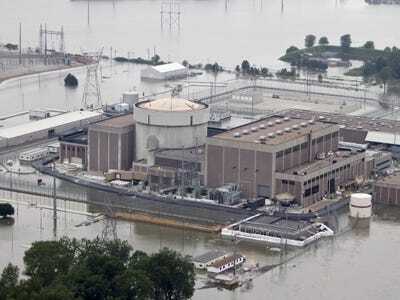 On May 27, the Omaha World-Herald reported, “The Omaha Public Power District said its nuclear plant at Fort Calhoun, which is shut down for maintenance, is safe from flooding.” The implication is that being shut down makes a plant safe. But as the ongoing crisis in Fukushima demonstrates, nuclear fuel remains hot long after a reactor is shut down. When Fort Calhoun is shut down for maintenance and refueling, only one-third of the fuel in the reactor core is removed. Many articles have reported that the temperature in the spent-fuel pools rose 2 degrees during the recent power outage. That may not sound like much, but only a few articles told readers the actual temperature of the pool. And a 2 degree rise from, say, 210 degrees Fahrenheit to 212 degrees Fahrenheit (the boiling point for water) would be catastrophic. The pool is normally kept at about 80 degrees Fahrenheit. OPPD estimated that, in the absence of any power to circulate coolant, it would take about 88 hours before water in the pool would begin boiling. The flight restrictions were set up by the FAA as a result of Missouri river flooding. OPPD spokesman Jeff Hanson told Business Insider that the nuclear plant is in a “stable situation.” He said the Missouri River is currently at 1005.6″ above sea level, and that no radioactive fuel had yet been released or was expected to be released in the future. Asked about the FAA flight ban, Hanson it was due to high power lines and “security reasons that we can’t reveal.” He said the flight ban remains in effect. The facility was taken offline to refuel earlier this year so the containment building has been flooded by OPPD in order to cool the fuel rods. Hanson adds they have a number of backup systems in place to continue to pump clean water through the spent fuel pool and into the reactor containment building so he says there is nothing to fear.